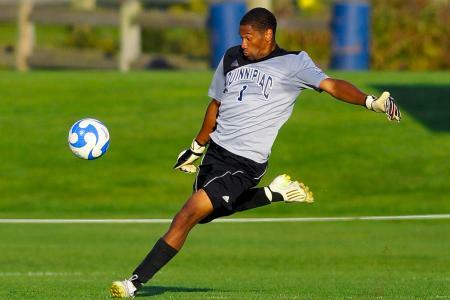 Bermuda Hogges goalkeeper Freddy Hall is set to trial with English football team Plymouth Argyle, and news reports say he is likely to take part in tonight’s [July 13] friendly match with League Two Torquay United. Mr Hall arived in England on Saturday, but was considered too jet-lagged to take part in Argyle’s game against Truro City that night. Argyle boss Peter Reid said Mr Hall had been recommended to head coach Paul Mariner by former Newcastle United and West Ham goalkeeper Shaka Hislop. Mr Hall, if signed on, would probably be back-up for the experienced Romain Larrieu. Mr Larrieu, a 33-year-old 6ft 2″ French goalkeeper, is Argyle’s current longest serving player, having joined them in 2000. In the 2006–07 season, he suffered with testicular cancer, and is presently the team Captain. Plymouth Argyle Football Club, commonly known by their nickname, The Pilgrims, are an English professional football club based in Central Park, Plymouth. They play in Football League One, the third division of the English football league system, having joined the Football League in 1920. Since becoming professional in 1903 the club has won six Football League titles, one Southern League title and one Western League title, with their most recent success coming in 2004 when they were crowned Second Division champions. The 2009–10 season is the club’s 41st in the second tier of English football. In the 2009-2010 season they were relegated to the third tier of English football. Plymouth holds the record for most third tier championships won (4; 2 under the Football League Third Division South, one in the Football League Third Division before 1992, and one in the Football League Second Division between 1992 and 2004).